I am blown away by the amount of people who read this blog and the worldwide reach it seems to have. The parts of the map highlighted above are the countries I get visitors from (the brighter the colour the more visitors from that country). 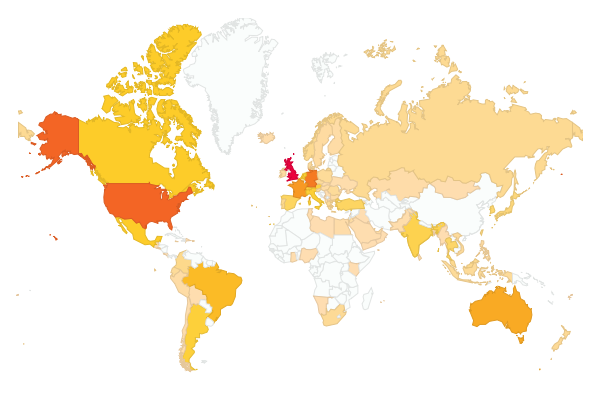 The blog has had visitors from all over the world; from the US and Australia all the way to Mongolia and Kazakhstan! I just want to thank all my readers and hope you find this site useful. There is a point to this post, I would like to hear from you! If you are a regular reader or just read the occasional article it would be great to hear what you think of the site, my work, or just to drop me a simple hello. I see I have regular visitors to my page, and it would be great to know what keeps bringing you back. Please leave any comments below or drop me a line via the contact link at the top of the page.